Our members are ordinary people, just like YOU. Over the years we have had barbers, pilots,repairmen, CEO's,carpenters, ministers, electricians, air traffic controllers, doctors, lawyer,dentists.... you get it ... everyone is welcome.... Young people should take advantage of the wealth of knowledge that these men possess and feel safe knowing that everyone is treated as an equal. The most important thing is making wonderful music. 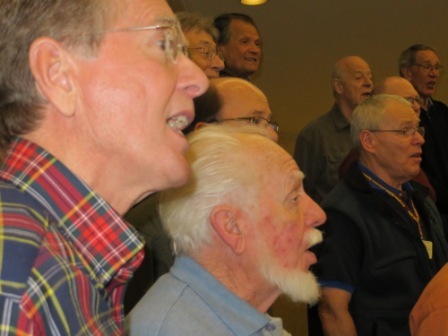 Go to "Join Us" and click on " Find Your Voice Part" to hear what the various voice parts sound like... then sing along with the one that feels best for you and if you want more come out to a Thursday reheasal and sing it with us because that is what we do!